Normally a woman attempting to gain membership to an all men’s club wouldn’t be a cause for laughter. 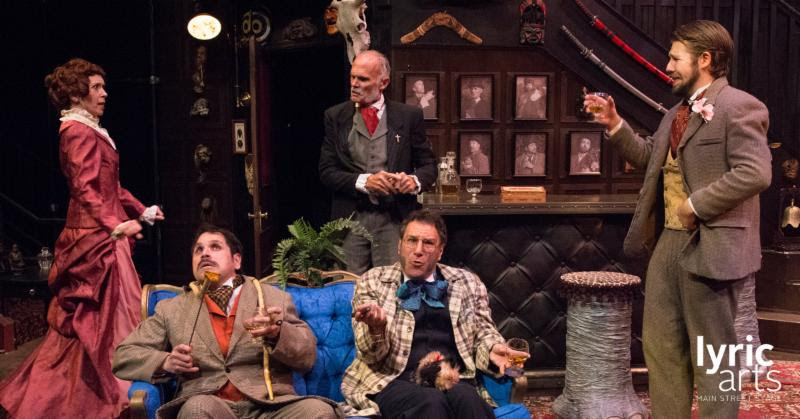 But in Nell Benjamin’s The Explorers Club, which opened the 20th Season at Lyric Arts last night, a woman gaining membership to the boys’ club is just what they need to shake things up a bit. When Lucius Fretway (Brandon Osero) proposes extending membership to Phyllida Spotte-Hume (Jessica Scott) after her discovery of a lost city and civilization, the Explorers Club’s reserved atmosphere is upheaved and gives way to a laughter filled adventure including harboring a fugitive and hiding from the British Army gearing up for war right outside. As Luigi, Phyllida’s find while discovering the lost city, Brendan Veerman is outstanding. His ability to physically bring a character to life is amazing. He doesn’t have many lines, but his mannerisms and the curiosity of his character add an element of fun to the show. You never know what Luigi will do or attempt to say next. Under the direction of resident director Matt McNabb, The Explorers Club is the perfect mix physical comedy and line inducing laughs. Not to mention a pretty spectacularly choreographed routine involving passing drinks out at the bar. Brian Proball’s rich set design along with Emma Davis’ prop design add layers of character and depth to the story. My favorite set piece is the elephant leg stools. The attention to detail on these is impressive. I am always impressed and surprised at how Lyric Arts continues to raise the bar from production to production. They spare nothing to ensure their audiences are experiencing the best productions they can offer and the cast and crew have the perfect platform to share their talents with the masses. The drive to Anoka is worth it just to experience such exquisite work and talent. The Explorers Club plays through September 27 at Lyric Arts in Anoka. For more information on the show or to get tickets, visit Lyric Arts’ website.